Srinagar: A day after the government withdrew security cover of Hurriyat Conference (M) chairperson Mirwaiz Umar Farooq, at least 200 youth have voluntarily decided to guard the top religious cleric to ensure his safety. 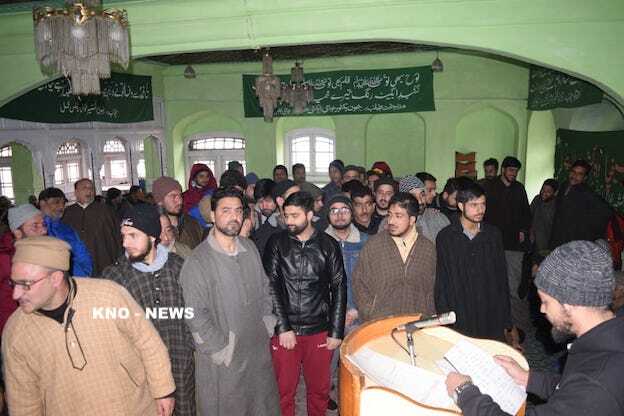 Talking to a news gathering agency, KNO, Awami Action Committee (AAC) youth President Mushtaq Ahmad Sofi said the youth at least 200 in number have reached Mirwaiz Manzil in Rajouri Kadal in Srinagar and have decided to act as security of Mirwaiz. He said the youth are enrolling themselves and the decision in this regard will be taken shortly. Earlier on Sunday, Government withdrew all security and government facilities provided to Mirwaiz Umar Farooq and three other Hurriyat leaders. The Government has withdrawn security and any government facilities provided to separatist leaders including Mirwaiz Umar Farooq, Prof Abdul Ghani Bhat, Bilal Gani Lone and Shabir Shah. “All security and any vehicles provided to the separatist leaders would stand withdrawn by Sunday evening,” officials said.